The circular shape of the monument was not chosen arbitrarily. It allowed the reprodution of the celestial vault and determined the three astronomical theories about the sun. b.	the cycle of the Precession of the Equinoxes with the colonnade of the 26 Doric columns. c.	The Heliocentric System inside the wall/cella on the pavement with the symbolic white stone, the sun, at the center of the floor. From a distance and outside the monument the visitors could see the 26 Doric columns, that is the symbolic cycle of the Precession of the Equinoxes (Plate page). The visitors, moving ahead and standing between the Doric colonnade and the cella/wall, could see the apparent course of the sun. Only the initiated and the Priests/Hierophants knew the meaning of the 26 columns. Inside the monument, well hidden from the non-initiated, the Heliocentric System was the prominent feature on the pavement. 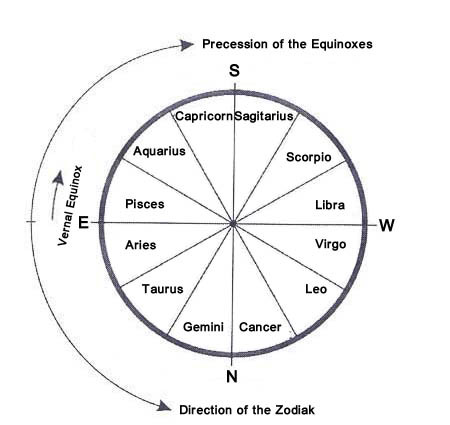 The Precession of the Equinoxes or the cycle of the “Complete Precessional Period” moves clockwise and follows the direction of the polar axis of the Earth, whereas the course of the Earth and the Planets is counter clockwise.